The Ntel website has been down for over a month now and no reason was given by Ntel. This has actually made subscribing for data plans very difficult especially for those who wants to subscribe for the Wawu plan. Since the website is inaccessible, the only alternative method of subscribing for the Ntel Wawu plan is by topping up your line through the available E-channels and then contacting Ntel through either Facebook, twitter or via email for them to help you activate the plan from their own end.This method takes time and it's not convenient. The good news however is that site is back online and you can now Log-in without any issue. 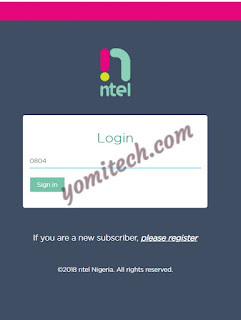 Although Ntel hasn't made any post on this, you can visit the website now to top-up your line, activate a data plan or even check your data balance. All you need t do is just to visit myntel.com.ng.